Cellfood Weight Loss, with amino acids, electrolytes, digestive enzymes, and minerals helps regulate metabolism and breakdown organic material, while increasing your fat burning potential... even while you sleep! That's right, even while you sleep! Just stop eating, three hours before you go to bed, drink 20 drops of Cellfood Weight Loss in 8 oz. of water, and go to sleep. It's that simple! Regular monitoring of body fat, in addition to good nutrition and exercise, is a prescription for optimum health. Cellfood Weight Loss is available in 4 oz. plastic bottles. 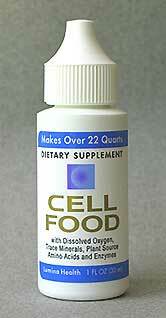 Cellfood diet: Deeply detoxifies the body, cleanses the liver and bowels, and reduces stress. Being overweight or obese is a serious health problem linked to high blood pressure, heart disease, diabetes, and even cancer. Recent studies show that one third of American adults are overweight, and almost one quarter of American children are overweight. These are alarming statistics considering that obesity is the single most preventable cause of death, after smoking. Cellfood Weight Loss is an essential part of any weight management program. This unique and amazing formula combines the "fat burners" Citrin K and L-Carnitine with CELLFOOD®.Here is the skinny on body fat; the ideal body fat zone for males is 14%-20%, and the ideal zone for females is 17%-24%. Low calorie starvation diets are not healthy, and high L-Carnitine is synthesized in the liver by the human body and has been shown to have a remarkable effect in the cellular metabolism of fat by transferring fatty acids to sources of energy. Carnitine is a vitamin-like nutrient that is produced naturally helping to carry fat into the mitochondria. (your fat incinerator) In addition, L-Carnitine helps the cardiovascular system as well as the heart muscle. The heart gets two-thirds of its energy by burning fat, and Carnitine helps feed the cardiac engine. Studies also show Carnitine raising the HDL cholesterol, the protective cholesterol fraction, and helping to keep arteries clear. L-Carnitine may also lower triglycerides and help lower blood pressure. Suggestions for use: Shake bottle gently. Mix 20 drops in 8 oz. purified water or juice. Take at bedtime. For best results stop eating 3 hours before taking Cellfood diet. Must be taken on empty stomach. No refrigeration needed. Safe to take with other Cellfood products.